"I never set out to write thematic cds or put a mission statement to a record, but one always seems to stand up and makes itself evident even after the recording process has been completed. That's what happened with love will rise. CD's, for me, are typically a collection of songs that happen to be faith expressions. It is an opportunity to share my faith experience and point people towards Jesus through quality art." "The theme of this CD is the title:LOVE WILL RISE. I am trying to be a balloon.. in the sense that a balloon isn't fully what it is intended to be until it is filled with that which is lighter and less dense than everything else around it. A balloon isn't fully a balloon until it rises. We are the same. Love rises. The Spirit of the Lord rises. So, why don't we go ahead and be what the Lord has always intended us to be....and let ourselves be filled with that which is rising. Love will rise." "Yes, love will rise in the midst of our rough stuff and struggles. Our troubles won' be taken away, but the Lord will use them to construct us into who he would have us become. Romans 8:32 says....and I paraphrase, Won't he who didnot withhold his own son, but gave him up for us, continue to give us all things? So, I guess EVERYTHING that comes our way (the good, the bad, the smooth, therough, the light, the dark, the easy, the hard) will be used by the Lord. it seems, that many times, the Lord ESPECIALLY uses our struggles to construct us. Yes, He will twist us and turn us and mold us and shape us..through every situation....because love will rise." Mitch McVicker - Music and lyrics & lead vocals. Ken Lewis - Percussion & Drums. Nathan Nockels - Engineer, Organ, Percussion, Guitar, Programming, Melodica, Keyboards, Piano, Accordion. Jim DeMain - Mastering and mixing sound tracks. WOW! What a spirit-raising, positive, hopeful collection of songs! This album of songs, LOVE WILL RISE surely does share Mitch McVicker's faith experience and "points people towards Jesus through quality art." Mitch is a Christian music songwriter and vocalist who has developed his own style and vision, showcased in this CD. His music encourages, uplifts and entertains the listener while feeding the soul, with the encouraging promises offered to believers of Jesus,& seekers, based on Biblical scripture and what he has learned in his faith journey. 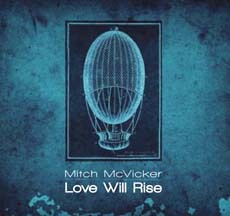 LOVE WILL RISE truly reflects both the creative spirit and "faith expressions" of songwriter and vocalist Mitch McVicker. The great combination of spirited to poignant, always energetic, well-written, professionally presented compositions, with dynamic musical performances from the musicians in the various ensembles, meaningful lyrics and Mitch McVicker's interesting vocal styles. All these elements come together to offer a unique musical package which is both most enjoyable and full of encouraging lyrical messages, so well expressed by a man inspired by the Holy Spirit, and his faith and relationship he has with Jesus. LOVE WILL RISE presents a variety of musically interesting compositions, that are refreshing, musically different, acoustic and piano driven, with a "Jesus folk" rock base spirit and energy which is irresistible, sure to lift the soul from the negativity of life in this world, an into the presence of the Lord. The use of dynamics, building of sound and intensity, as well as solid musical accompaniments with inspiring bridges and tags/vamps , propelled along with just the right combination of instrument voices and a variety of rhythms and tempos that are all well done, well-executed and performed; providing the perfect musical vehicle needed for each song's lyrical message. LOVE WILL RISE offers a variety of poignant, stirring upbeat anthems ( * PRECIOUS BLOOD * STRAP MY HAT ON * ALONG WITH THE ROCKS * WALKING ON AIR * HONEST OF HEART). Two folk rock songs with elements of funk, which cook along with tight rhythms and dynamic accompaniment are (PARTYSONG * SEND YOUR SHOWER). Sure to please the listener, as they do this reviewer, are the lively, enthusiastic praise and worship celebration of Jesus songs, that have wonderfully infectious melodies and an added spirited energy, sure to be loved in any contemporary or blended church service or fellowship gathering;(WOUNDED ONE * WONDERFUL * HALLELUJAH * MAGNIFICENT). Mitch's vocals and the backup vocals are well done, dyanmic and expressive, truly inspiring. His style ranges from stronger, more traditional vocals;(MAGNIFICENT), to a more rock-funk-blues style (PARTYSONG * UPON FURTHER INSPECTION). No matter what style he uses, his diction is clear, he is on key, he has strong breath control, enabling him to make some hard octave jumps, and hit the mark on some lower notes as well; (STRAP MY HAT ON). Most important quality of his voice is that the listener can hear his own inner joy, faith, peace and thanksgiving coming through in all his vocals. Mitch sings from a first person perspective, making the songs "personal faith expressions", yestifying and sharing what the Lord has done for Him, and what he learned from it. From his bio page, one can see that Mitch has been through hard adventures and trials, as well as experienced the love and mercy of the Lord. The listener is blessed and encouraged. Mitch summarizes, "So, I guess EVERYTHING that comes our way (the good, the bad, the smooth, therough, the light, the dark, the easy, the hard) will be used by the Lord. it seems, that many times, the Lord ESPECIALLY uses our struggles to construct us. Yes, He will twist us and turn us and mold us and shape us..through every situation....because love will rise." Important to remember the Lord's's blessings and praise Him for who He is and His character, showing our love despite our scars and hurts. Remember the Lord's promises, and hang onto them in faith. We can look forward to eternal life. Be encouraged with God's promise to believers: A celebration in heaven at the banquet of the welcoming, loving Bridegroom. Being with Jesus, with no more trouble of this world. Love will rise in the midst of our rough stuff and struggles. Mitch Comments,It seems, that many times, the Lord ESPECIALLY uses our struggles to construct us. (STRAP MY HAT ON) -Develops our faith as we turn and depend on HIm. We have Jesus as our Lord and Savior, ever faithful and loving. The Holy Spirit also was busy, inspiring the team behind the performances of musical accompaniments, the recording, mixing and producing of LOVE WILL RISE as well. LOVE WILL RISE presents a variety of musically interesting compositions, wonderful choruses, memorable, catchy melodies, and precise rhythms which sound easy but take considerable musical skill and experience. Keyboards were memorable, my favorite performance being the intro and interlude in COME TO THE WELL. Nice touches of other instruments, like a mandolin (HALLELUJAH), slide guitar (COME TO THE WELL), harmonica, and accordion (HONEST OF HEART) add musical depth and interest to the various compositions. The quality of the musical performances recorded are professionally done, picking up the precise, delicate inner supportive musical voices, and melody accompaniment, as well as the vocals, thanks to the posse of engineers, who also played in the musical ensembles of the songs;(Nathan Nockels * Christine Donahye & Gary Burnett). The ever important mixing of tracks by Jim DeMain creates the just right blend of instrumental voices, vocals and dynamics, which are so important in music. Overseeing the making of LOVE WILL RISE were the talented producers, Margaret Becker and Nate Nockels of WATERMARK, who are gifted Christian music artists in their own right, understanding the acoustic folk rock genre well, letting Mitch McVicker express his songs in his own distinct style. I was thankful that the use of the synths was delicate, purposeful, and well-tempered, and didn't become overbearing, which is a pet peeve of mine. They also participated in the various music ensembles of some of the songs. They understand the acoustic folk rock genre well, and appreciate the creativity and inspiration of Mitch McVicker's songs. LOVE WILL RISE is an inspiring, uplifting, motivating collection of songs, a great cure for all your hard adventures, bumps in the road, and storms & tribulations, as well as an encouraging tool to build faith in our Lord, as these songs point to Jesus in most delightful ways, both musically and spiritually. I highly reccommend LOVE WILL RISE, an album truly worthy of a spot in your Christian music collection.